As anybody who owns reusable contact lenses knows, they need to be cleaned with contact lens solution each night to ensure they are free from bacteria and can be safely reworn the next day. For the vast majority of people, this process is one they have been following for years and has never presented any problems, but new research suggests that some people may be needlessly putting their vision at risk by deviating from the regimen. According to new research carried out on behalf of Biotrue multi-purpose contact lens solution, a shocking 20 per cent of people have at some point tried strange and possibly damaging alternatives to contact lens solution. Many of these are not designed for use in the human eye under any circumstances and may cause pain or even result in serious eye health problems if used. Nick Dash, an optometrist from Visual Edge Optometrists, revealed that some of the more far-out alternatives to contact lens solution used include baby oil and beer. "Although the numbers for the more extreme examples such as beer and baby oil were low, it is most concerning to see the risks people are willing to take when it comes to their eye health," he explained. "Alcohol, found in beer, is corrosive on the cornea and can cause serious lasting damage, while baby oil can irritate the eye and cause severe blurring." Saliva was one of the alternatives that featured highly on the list of things people have tried in place of contact lens solution. However, with the average adult mouth containing between 500 and 1,000 different types of bacteria, it is an unadvisable form of eye lubrication and should be avoided at all costs, Biotrue noted. 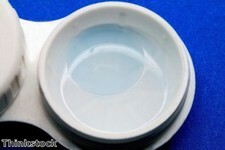 It added that the same thing could be said of water, which had been used by 16 per cent contact lens wearers as a makeshift solution. In addition, water also does not disinfect lenses or remove proteins that could build-up on the lens as they are worn, which could cause discomfort to wearers. Mr Dash said it is "really important" for contact lens wearers to follow proper contact lens hygiene to maintain eye health and to keep their lenses clean and comfortable, and said there is good reason multi-purpose lens solutions are carefully developed. "Modern lens solutions have been designed to protect your eyes in many different ways: from cleaning and disinfecting the lenses, to conditioning the lenses making them more comfortable to wear," he explained. "The potential problems caused by poor lens hygiene are many, including symptoms such as itchy, red or tired eyes, to more serious issues such as infection that can cause loss of vision." He explained that multi-purpose solutions are specifically designed to keep contact lenses clean and clear, ensuring people's eyes stay as healthy and comfortable as possible. Biotrue noted that its multi-purpose solution was developed following intensive studies on how the eye naturally works to clean, hydrate and keep itself healthy and can help to keep lenses moist for up to 20 hours – something homemade alternatives definitely could not do. The company said the solution also has "exceptional" disinfection properties and is formulated to work like the eye itself, thanks to three bio-inspired innovations. As long as people use an official contact lens solution for their reusable contact lenses, they are unlikely to suffer form the kind of infections that people who use alternatives are putting themselves at risk of contracting.